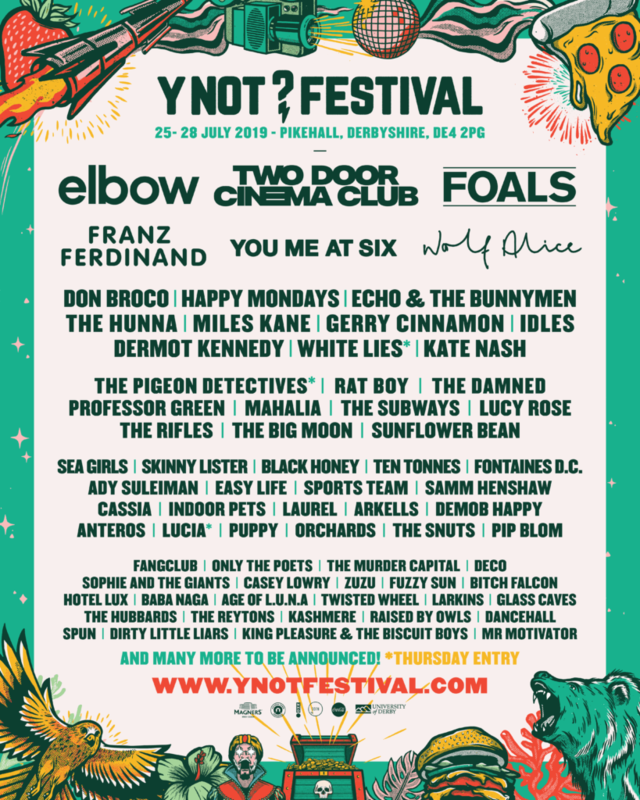 FOALS, TWO DOOR CINEMA CLUB AND ELBOW TO HEADLINE Y NOT 2019. We’re back! And BRIMMING with excitement about our biggest line-up yet! On Friday night Guy Garvey and his award-winning band ELBOW are taking a road trip across from Manchester to serenade us with their orchestral sounds. We’ve got SHIVERS just thinking about it. Saturday night TWO DOOR CINEMA CLUB are BACK to finish what they started. Expect electric indie-bangers as the Irish trio bring hit after hit…whilst we all stand in the crowd trying to keep up with “we’re-gonna-show-that-something-good-can-work-and-it-can-work-for-you”. It’s going to be something spectacular. Closing the festival are FOALS with a Pikehall pit-stop on their triumphant return to touring. With two albums on the way, an amazing first single ‘Exits’ and a back catalogue of upbeat, post-punk, math rock, there’s plenty to get excited about for what promises to be an incredible live show. And if this isn’t enough, we’ve got main support slots from Mercury prize-winning WOLF ALICE, rock heroes YOU ME AT SIX and Scottish phenomenon FRANZ FERDINAND. Making their Y Not return after five years for Thursday night are WHITE LIES, alongside indie heroes PIGEON DETECTIVES. You can view the whole line-up here. After an amazing 2018, tickets for 2019 have flown out quicker than ever. Tier 1 & 2 are already sold out but you can get your ticket and join us for the 3 days of music and camping now for just £129.50. Thursday entry is £30 and will get you an extra night’s stay!